WASHINGTON — President Donald Trump sought to stanch a public outcry over his administration’s “zero tolerance” immigration policy Wednesday, signing an executive order to end family separations at the U.S.-Mexico border after days of insisting he was legally unable to act. Trump’s abrupt reversal, contradicting his own aides’ defense of the practice, signaled a political retreat after an international backlash over images of hundreds of children being taken from their parents and held in cage-like detention facilities. But it remained highly uncertain whether the president’s hastily drafted order to keep families together in federal custody while awaiting prosecution for illegal border crossings would withstand potential legal challenges. And senior administration officials said the order did not stipulate that the more than 2,300 children already separated from their parents would be immediately reunited with them. Trump implored Congress to provide a legislative solution as the House prepared to vote Thursday on a pair of Republican immigration bills amid skepticism that either could pass. And in a bid to up the pressure, Homeland Security Secretary Kirstjen Nielsen warned lawmakers during a private briefing on Capitol Hill that the family separations could resume if they fail to act. At the same time, a senior Justice Department official told reporters that the administration had little legal recourse but to release the families after 20 days unless a judge grants an exemption to a 1997 court settlement and subsequent rulings limiting the detention of children. The executive order came after a day of frantic White House meetings as administration lawyers scrambled to produce a legally sound document to solve Trump’s political dilemma. Trump had begun to doubt his strategy, telling Republican lawmakers privately on Tuesday night that the images of the children were a “bad issue” for the GOP. Early Wednesday, Trump surprised his aides by ordering them to write an executive order and saying he wanted to sign it before leaving for Minnesota, despite telling reporters Friday that such an order could not be done. Chief of Staff John Kelly and White House Counsel Donald McGahn pushed back, arguing that an executive order could not be written to comply with the legal limits on child detentions — an argument that Trump had championed publicly in recent days — prompting a debate among the president and his aides, according to officials with knowledge of the deliberations. Kelly urged the president to continue pressing Congress to pass a law and argued that signing an order would not solve the problem. McGahn continued to question the legality of the executive order, according to the officials. Many aides, though, including Ivanka Trump and Kellyanne Conway, urged the president to end the separations. Eventually, after a number of meetings, ideas and drafts, McGahn said the final product could be legal. The slapdash nature of the effort was apparent when the White House released an initial version of the executive order that misspelled the word “separation.” Senior DHS officials went through the day with little or no knowledge of what the executive order would ask them to do, or how it would alter the policy they’ve been instructed to vociferously defend in public for the past several weeks. The episode left many aides puzzled over the administration’s strategy in the immigration fight. The outcome also failed to quell the political fight, as Democrats and immigrant rights groups said the executive order appeared to be an effort by the president to incarcerate families indefinitely. In recent days, Trump and his senior advisers had vociferously defended the administration’s strategy, announced by Attorney General Jeff Sessions in April, to seek criminal prosecutions of all adults who illegally cross the border. Under the law, they said, federal authorities had no choice but to take away the children, who are not permitted to be held in adult jails. 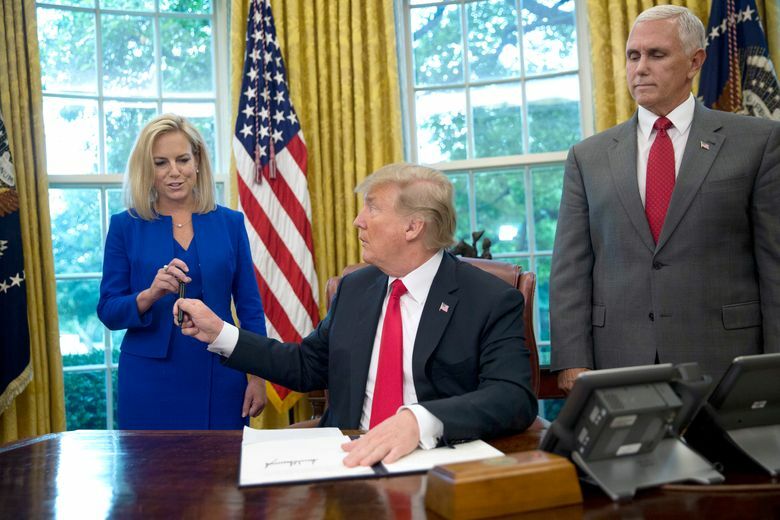 Trump falsely blamed Democrats for having created the family separation policy, while other top aides, including Nielsen, erroneously stated that the separations were not the result of any policy changes from the Trump administration. The president, who has been angered by a spike of illegal immigration this year driven by Central American families, had held out against the growing tide of critics under the belief that his hard-line immigration stance was a political winner with his conservative base. But the backlash from prominent Republicans, world leaders including Pope Francis, as well as private recriminations from first lady Melania Trump, prompted Trump to reverse himself. The upshot, however, was widespread uncertainty about what comes next. One senior DHS official acknowledged that Immigration and Customs Enforcement has almost no ability to add detention capacity for families because its jails are already full. If Congress fails to pass an immigration bill, the government will land in essentially the same place the Obama administration was in during a similar spike of families at the border in 2014, with no place to house them. The DHS official said ICE is not planning to put children in adult detention centers as prohibited under the 1997 court settlement in Flores v. Reno, which stipulated immigrant children must be placed in the least restricted environment possible while awaiting immigration court proceedings. Any emergency shelters erected on military bases would need to be licensed, while still running the risk of violating child detention standards. The result, the DHS official said, is that absent a legislative fix, thousands of families in ICE custody will have to be released, marking a return to the “catch-and-release” system of past administrations that the Trump administration vowed to end with its zero-tolerance policy. As for the more than 2,300 children who already have been taken from their parents, top officials at the Department of Health and Human Services, which oversees their supervision, were unable to say when the families would be reunited. Trump’s executive order instructs DHS to keep families in custody “to the extent permitted by law and subject to the availability of appropriations” — language that points to the government’s deficit of detention space for parents with children. ICE operates two large family detention centers in Texas and a smaller facility in Pennsylvania, with a combined capacity of about 3,000 beds. As of June 9, the three facilities had nearly 2,600 of those beds occupied, according to the latest available ICE figures. The enforcement agency already is stretched to capacity with adult detainees. The agency has had an average daily population of 41,280 detainees during the government’s 2018 fiscal year, according to the latest figures, a number that exceeds what Congress has authorized DHS to spend. “It’s an unqualified retreat for the president,” said Muzaffar Chishti, the director of the Migration Policy Institute at the New York University School of Law. Chishti said the Trump administration faces steep odds in appealing to U.S. District Judge Dolly Gee in California, whose 2015 decision in the Flores case set the 20-day limit for child detentions. Gee, appointed by President Barack Obama, is considered liberal on immigration matters, and legal experts do not expect her to oblige the administration. The Justice Department would then have to appeal to the U.S. Court of Appeals for the 9th Circuit and, perhaps, the Supreme Court. The Washington Post’s Mike DeBonis, Amy Goldstein, Sari Horwitz, Seung Min Kim and John Wagner contributed to this report.